Green beans are a classic dinner side-dish staple. And, while they are versatile and easy to prepare, it’s sometimes hard to know what to do with them beyond just roasting or steaming. 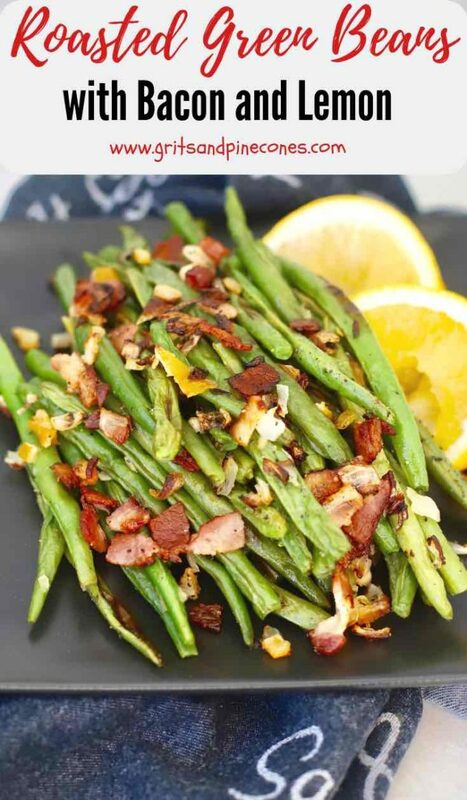 If you are in a green bean rut, you will want to try this recipe for quick and easy Roasted Green Beans with Bacon and Lemon. How do I make Green Beans taste good? This green bean recipe brings together a myriad of flavors, and we are obsessed with how good they are. I’m sure once you prepare them, you will be too! Hey, you might even convince your big and little kids to eat their vegetables! 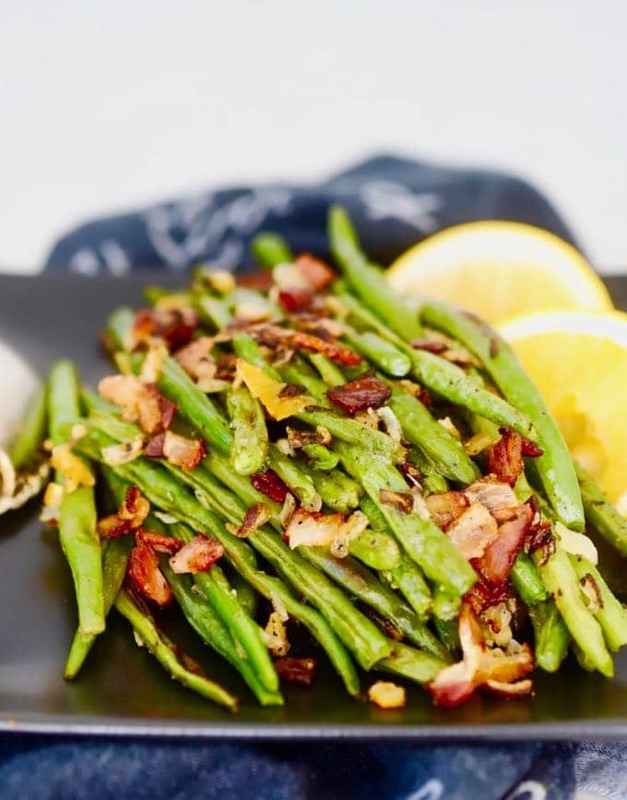 There are lots of green bean recipes with bacon out there, but I think you will find that the addition of the preserved lemon sets this one apart. If you follow my blog, you will know I don’t like many cooked vegetables. So, I am always on the lookout for new and tasty ways to incorporate more of them in my diet. Well, my friends, this green bean recipe is a winner! In fact, after I took the photos, I ate the entire thing for breakfast. Yes, this is what food bloggers do. We eat all sorts of crazy things, at all sorts of crazy times, but at least I’m eating vegetables. It could be much worse! If you like green beans, you might also like these other popular green bean recipes on my blog: Southern Green Beans and New Potatoes, Southern Sweet and Sour Green Beans, Green Bean Pie with Ritz Cracker Pie Crust, and Green Bean Bundles Wrapped in Bacon. If you are not familiar with preserved lemons, they are simply fresh lemons which are preserved in a salt and lemon juice brine. They last forever in your refrigerator and you can buy them at specialty food stores, or make your own. Preserved lemons add an intense, concentrated lemon flavor to dishes and you won’t believe how easy they are to make. 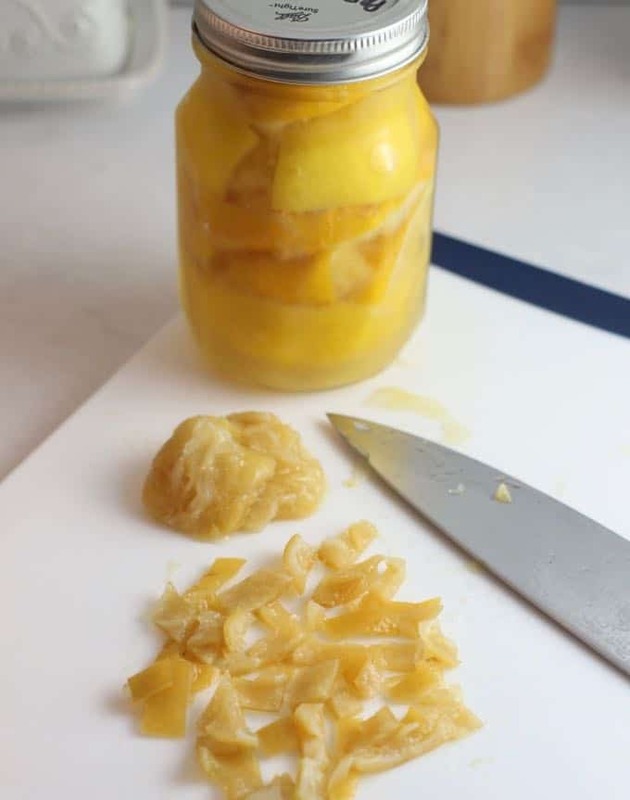 Check out this post on my blog: How to make Preserved Lemons, and make some today. 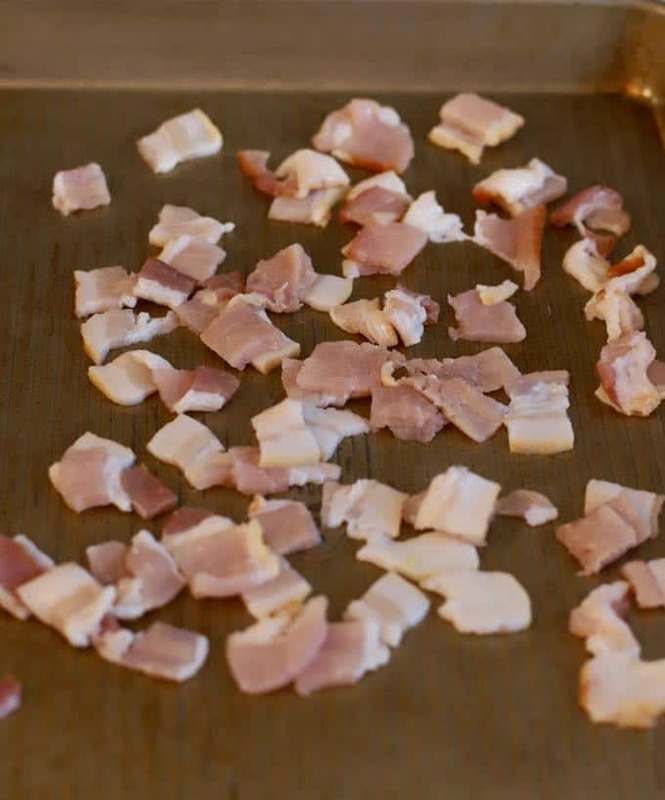 Place the chopped bacon on a rimmed baking sheet and bake for about 5 minutes to partially cook and render some of the fat. Remove the pan from the oven and set aside to cool. 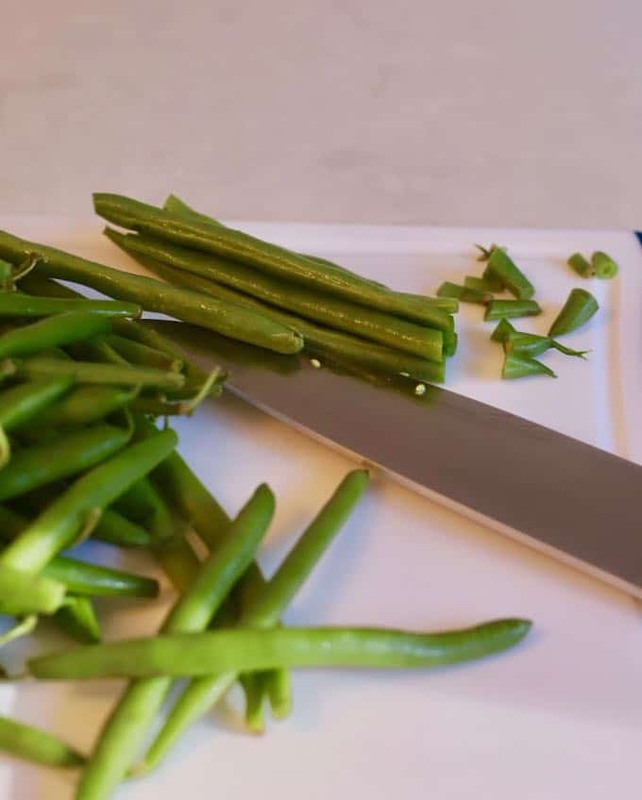 Remove the stems from the green beans by lining up a handful on a cutting board. Use the edge of your knife to even the ends and cut off all of the tips at once. Turn them over and repeat on the other side. Repeat with the rest of the beans. Take the piece of preserved lemon and scrape off the pulp with a knife or spoon. Rinse the peel with water and chop into small pieces. 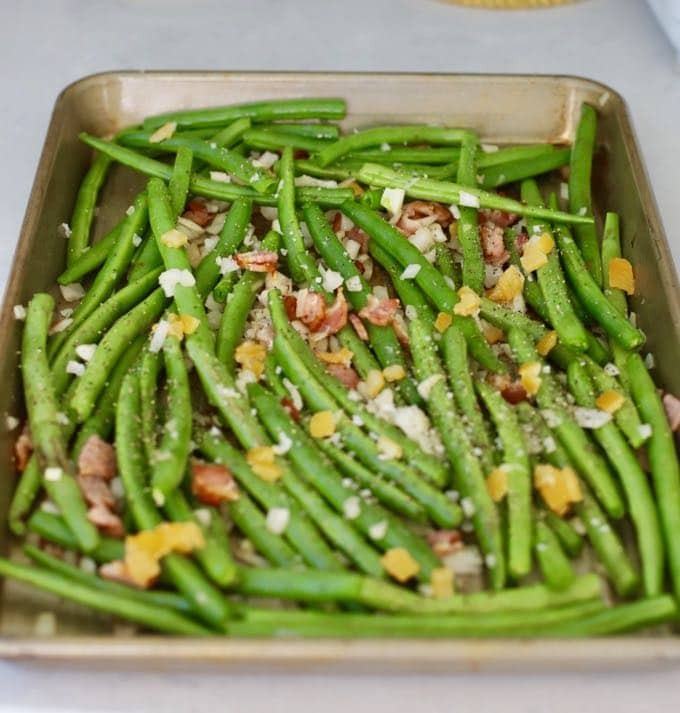 Place the trimmed green beans on the baking sheet with the bacon. Add the onion, lemon, salt, and pepper. Toss until everything is combined and the beans are coated with the bacon fat. Roast for 18-20 minutes or until the bacon is browned and the beans are tender. Remove from the oven and serve hot. You can substitute the zest of one regular lemon, or a quick squeeze of lemon juice for the preserved lemon. However, if you are using lemon zest or juice, don’t add it to the beans until they are done and then, sprinkle over the top just before serving. Feel free to add chopped up red or yellow bell pepper, or carrots to the green bean mixture or another vegetable you like. Just make sure whatever you add will cook in about the same amount of time. If for whatever reason, your bacon doesn’t render enough fat to coat the green beans before roasting, simply add a teaspoon or so of olive oil and toss to coat. 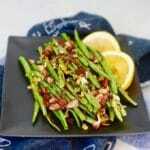 Roasted Green Beans with Bacon and Lemon, is impossible not to like. 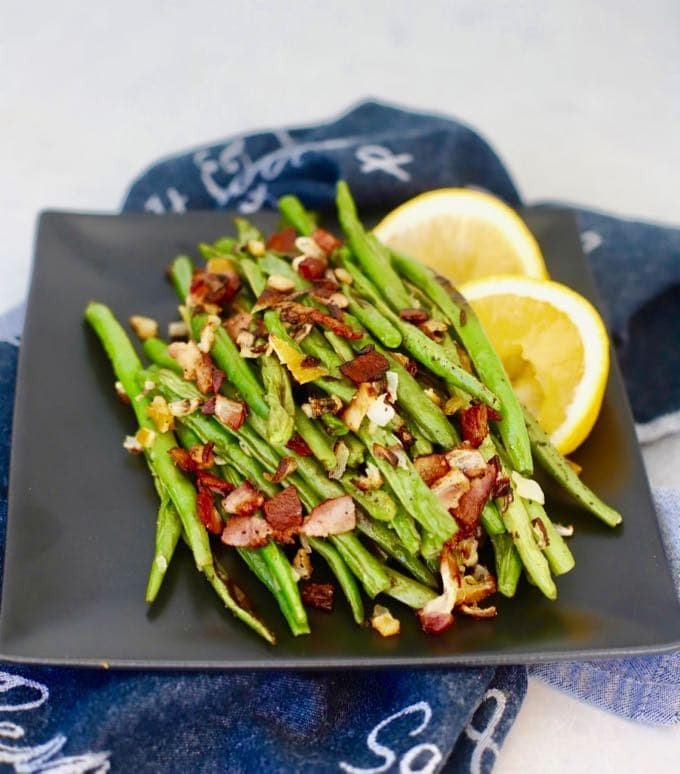 Full of nutritious green beans, crispy bits of smoky bacon, and the freshness of preserved lemon, this green bean recipe is even more delicious than it looks. Remove the stems from the green beans by lining up a handful on a cutting board. Use the edge of your knife to even the ends and cut off all of the tips at once. Turn them over and repeat on the other side. Repeat with the remaining beans. You can substitute the zest of one regular lemon, or a quick squeeze of lemon juice for the preserved lemon. However, if you are using lemon zest or juice, don't add it to the beans until they are done and then, sprinkle over the top just before serving. If for whatever reason, your bacon doesn't render enough fat to coat the green beans before roasting, simply add a teaspoon or so of olive oil and toss to coat. This recipe looks delicious. If I do not have preserved lemon could I just use a store bought lemon? Would I still use just a 1/4 of the lemon? If you are going to use a fresh lemon, I would just either use the zest of one lemon, or a generous squeeze of juice over the dish when it comes out of the oven.